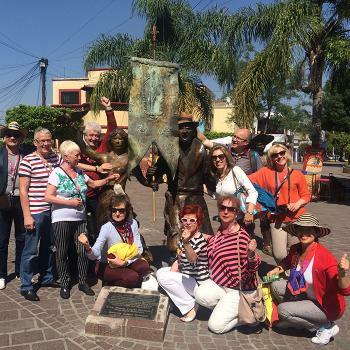 Rotary Friendship Exchange is when a group of Rotarians from one Rotary district in the world travel to another for fun and fellowship. It's a wonderful way to travel, but it's not like a regular holiday, it's an experience. You'll learn about how the locals live, make lifelong friends and discover new cultures and communities. Often you share Rotary projects and ideas. Exchanges are usually reciprocal. Rotary International has documents that explain the program, although each district does it a little different, District 5020 follows the below pattern. There is a RFE District Chair that communicates with potential districts to travel to in communications with the District RFE Committee. Once a district is chosen to partner with, word is distributed. Each participant funds his or her own way. Couples or singles are welcome. All Rotarians are invited and their partners. (I.e. partners do not have to be Rotarians friends of Rotary may also apply through their local Club). Youth can also be a part of RFE, and will be considered on a case by case basis. Please ask. Generally a RFE lasts about 2 weeks. Some Districts ask for shorter periods. Around 8 - 12 form the team, which includes a team leader. The team lands at the pre-determined date in the host country. From there the team is hosted by local Rotarians. The RFE team is home stayed, usually changing host homes every few days. Several communities are visited. The host Rotarians show their guests local sights of interest, parks, museums, things they are proud of. There are often Rotary hosted parties. Rotary projects may be toured. The hosts generally cover lodging and home meals. Transportation within the district is provided by the hosts but admissions or extraordinary costs such as restaurant meals are covered by the guests. The visit is then reversed with the foreign district visiting our district. RFE participants are expected to host for a few nights and participate when they visit here. (I.e. volunteer to host them for some or all of their days in the 5020 community you reside in. A typical tour may be 3 days in Nanaimo, 3 days in Sooke, 3 days in Poulsbo, 3 days in Olympia. The pace is usually brisk. Get up in the morning, maybe tour a Rotary project, and then maybe see a point of interest or two. In the evening there may be a Rotary meeting or party in the teams' honour to attend. The visiting Team is asked to provide a short presentation at the Hosts' Rotary meetings. You will travel with a group and your tour will be mapped out by the hosts. We often give input to preferences but generally what they plan is what we do. See parts of the world you may otherwise never see. If you go on an exchange, you will be expected to host when their team visits us. This usually means 3 nights in your town of 8 - 12 people. Or you can help in other ways - transportation, coordinating the return visit, etc. You will participate in their 3 days in your community. You will need the support of your club. Ask them. This should be be done BEFORE you apply. We would ask you to be active in your club and community seeking host families from your club or towns' clubs, and being active in the planning of their days in your town when they visit. Be an RFE ambassador. While on an outbound RFE, the experience is unlike a "holiday"whereas you are hosted,and you usually are not "asked" if you wish to attend events, you are told. You will be expected to participate fully, as you would when guests visit YOUR town and you map out events for them. Be open and flexible. Some of the things you see may not interest you - but often they turn out the most interesting. Expect the unexpected. We are all volunteers coordinating between clubs that may be many miles apart. Some may be wildly organized. Some maybe less so. Fun and flexible is our motto. Please review the information below, then send your questions. They come here July 2nd to 16th, 2019. We go there November 2019. This outbound team is full. District 5020 Intra-District RFE. A first. Historic! Twin Cities Rotary Club (Centralia - Chehalis, WA) wishes to foster better understanding, fun and fellowship between Clubs and countries within 5020. A brilliant initiative by Twin Cities. For this charter event the desire is an exchange between Twin Cities and any Vancouver Island club(s). Twin Cities would host Thursday to Sunday, August 15-18, 2019 You would arrive Thursday, depart after breakfast Sunday. The reciprocal exchange could be at a mutually agreed to weekend or period, but should be at least one month away from the Twin Cities dates. The two dates should be within 120 days of each other. The teams would consist of 8 - 12 members total, per. The Canadian side team selection would be put together by the club(s) involved, probably after we quickly choose a "Team leader", with consultation with the District RFE Chair. This is an opportunity for clubs to work together, if desired. Contact the July 1, 2019 Chair as detail below for details. District 2220 Russia. The RFE Teams will be 8 - 12 members. We go there approx. Sept 15 - 27, 2019. We host them Spring / Summer 2020. RC of Ekaterinburg is host, cities in the region also include : Volgograd, Krasnodar, Perm, Omsk, Novosibirsk. Moscow and Saint Petersburg are not in the District however will probably both be on the tour. This team has room for one more (single). Please ask. District 4640 Brazil. The RFE Teams will be 8 - 12 members. May 1 midday start – May 13 morning finish, 2020, 4640 Brazil to 5020. May 18 – 30, 2020 5020 to 4640 Brazil. District 2440 Turkey, The RFE teams will be 8-10 members. The exchange will be 7-10 days. We would go there roughly April 11 - 19, 2020. They would visit us June, 2020. Cities in the region could include Bursa, Canakkale and Izmir (includes Selcuk - Virgin Mary and Ephesus). Although Istanbul is not in the District it would make sense to land here and spend a few days before the start of the RFE. This team is full. If you wish to inquire about a waiting list, please ask. 5020 visits 4455 Peru roughly May 1, 2020. 4455 Peru visits 5020 roughly June 2020. Cities could include Lima, Ica, Arequipa, Moquegua, Tacna, Cuzco, Puno and Ayacucho. Land in Lima. We will announce this opportunity very soon, probably around April 14, 2019. District 1030, Northern East England. 5020 visits June 10- 22 2020. The exchanges will be around 12 nights each. District 1030 stretches from the Scottish border in the North, through Northumberland, …and Tyne & Wear, the powerhouse of the Industrial Revolution, and NEWCASTLE where Geordies and Newcastle Brown Ale come from. The suggested airport is Newcastle (in District) 1030, though Edinburgh (Scotland) is not too far and has some direct flights from the US. Newcastle flights are usually via London Heathrow. 2360 Sweden visits 5020 end April/beginning May, 2021. 5020 visits 2360 July/August same year. Each team will consist of up to 6 singles or couples, the visit will be 8-9 nights but could be adjusted at the time. Rotary District 2360, with 70 Rotary clubs and 3800 Rotary members, is in south-western Sweden, a region with more than 1,7 million inhabitants. Gothenburg, Sweden’s second largest city with about half a million residents is the main city in the district , founded in 1621. District airport is Göteborg. Cities could include Gothenburg, Alingsas, Marstrand, Tanum, Dalsland. The 5020 Outbound Team will be determined in 2020. Interested parties may email the chair for inquiries. RFE teams will be maximum 12. 9400 visits 5020 June 19 - July 3, 2021. 5020 visits 9400 October 9 - 23, 2021. Dates may vary slightly once booked. Who gets priority to travel as part of a team? Team members are selected based on geography and history. We need participants from varying communities in our district. We also look for as many different Rotarians to experience RFE as possible. Sometimes we have too many wanting to be a part of it (Brazil is very popular!) and decisions will have to be made. But with 2 or 3 or 4 RFE’s in the works – the goal is to have as many different Rotarians be a part of it as possible. Rotarians who love to travel, love hosting/assisting when they come here and love Rotary. Want to apply? Don't blame you. Click here for application. Chosen 5020 Outbound Team member? Congrats. Click here. "My experience on an RFE was amazing from the get go. Travelling solo, I (in Comox Valley) was paired with another Rotarian from Oak Bay. Her name is Anne. She has now become a ’sister friend’. We had so much fun together in Thailand. We knew nothing about each other before meeting in Thailand at 2:00 AM when I arrived, knocked on our hotel room door, and said, “I’m home.” She got up and hugged me and we have been laughing ever since. The Thai experience is probably quite different from other RFE in that we were housed in very nice hotels throughout northern Thailand. Our hosts were exceptional in organizing extraordinary experiences, filling the schedule, and making sure we were well fed and happy. We have made some awesome friends in Asia. Further to that, several of our group of twelve have stayed in touch and have even gotten together several times either in Port Angeles or Victoria since our trip in 2017. My RFE experience has been fulfilling on many levels." Janice Hayward, Comox Valley, Strathcona Sunrise Rotary Club. Thailand. 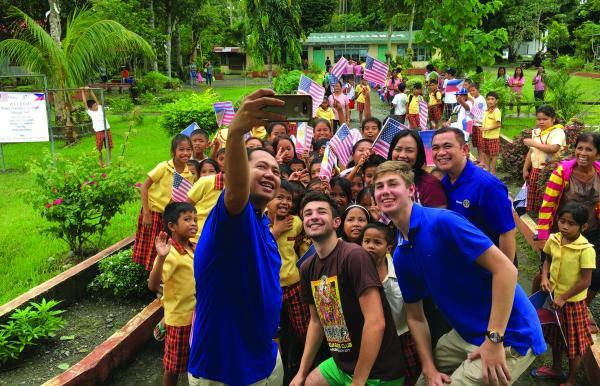 "A Rotary Friendship Exchange creates lifelong friendships. We still communicate to this day, especially at Christmas. And you get to see things and meet people that would otherwise not be possible. We loved every minute of it." Steve and Judy Henderson, Rotary Clubs of Olympia and West Olympia. (Summerset, England, & New Mexico. "The RFE was a unique travel experience that immersed us in the culture of the host district like few travel experiences could. We were treated to the home lives of 3 gracious host families. They shared their home tables, foods and traditions with us and even shared come cooking techniques and recipes. We came away with memories, pictures, music and and expanded appreciation of what in means to be a Rotarian. 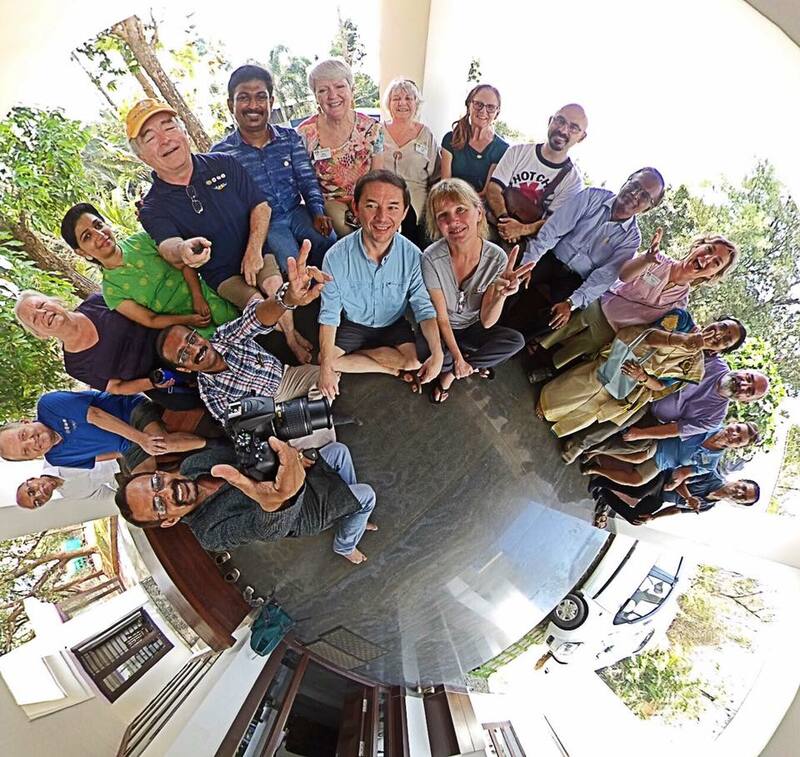 During the 12 days we spent in Kerala and Tamil Nadu India, the members of more than 9 clubs shared their Rotary stories, their favorite projects, their Rotaract and youth programs and showed us a marvelous friendship between clubs." Kathy Maher, Rotary Club of Bainbridge Island. "I have traveled a fair amount around the world and what made this experience different is that I got to meet lots of really interesting people who took great effort to treat us like royalty and to share what they love about their country and the place they live. That we have shared values and that they put so much effort into showing us those interesting things made this trip one of the nicest I have ever been on. A couple of years out, I'm still corresponding with some of those people. It's really about the people and the lasting friendships. " John Barrett, East Jefferson Rotary. New South Wales, Australia. To exchange with us click here.